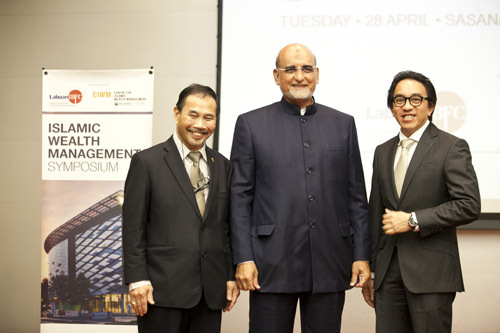 Kuala Lumpur, 28 April 2015 – The BNP Paribas – INCEIF Centre for Islamic Wealth Management (CIWM) and Labuan International Business and Financial Centre (Labuan IBFC) held their 2nd annual Islamic Wealth Management Symposium on 28 April 2015 in Kuala Lumpur, aimed at raising national awareness of Islamic wealth management, particularly Islamic trusts and foundations. The Director of the BNP Paribas – INCEIF Centre for Islamic Wealth Management (CIWM), Professor Dr Shamsher Mohamad said: "Waqf is the least exposed aspect of Islamic wealth management. It has great potential to spur economic growth and help develop the nation. History has provided us with evidence on how the waqf system can generate revenue to support education, welfare and even hospitals in Turkey and Egypt. The waqf is still functioning effectively today. In Malaysia, we have the potential, being a predominantly Muslim country, but need the support of the people and political commitment to make waqf a successful and complementary part of our nation’s economic support system. The Islamic Wealth Management Symposium 2015 is one of the many series of events planned and organised by CIWM to create awareness and seek ideas to lay the foundation to develop effective waqf structures in the country. There are many challenges ahead, but nothing is impossible, God willing." The Symposium also marked the public unveiling of Labuan IBFC’s international waqf foundation, the first Islamic foundation designed with the international market in mind. Labuan IBFC’s Chief Executive Officer, Saiful Bahari Baharom said Labuan IBFC is committed to strengthening its position as an international Islamic wealth management centre, and is the first international business and financial centre to establish a waqf using globally-recognised laws. "Labuan IBFC is Asia’s only midshore jurisdiction with conventional and Islamic wealth management solutions. Capitalising on this strength, the Labuan Financial Services Authority (Labuan FSA) established a waqf using widely-recognised foundation and trust laws, giving it greater international standing and appeal. It is our hope that the Labuan international waqf foundation will be taken up by Muslim communities in Malaysia and abroad," he added. From left: Prof. Datuk. Dr. Syed Othman Alhabshi (Chief Academic Officer, International Centre for Education in Islamic Finance (INCEIF)), Prof. Dr. Shamser Mohamad (Director, BNP Paribas - INCEIF Centre for Islamic Wealth Management (CIWM)), and Saiful Bahari Baharom (Chief Executive Officer, Labuan IBFC Inc). Datin Isharidah Ishak, Consultant at Messrs Isharidah, Ho, Chong & Menon. The merits of establishing an international waqf foundation. Segments from the event, including speaker presentations, are available on-demand at http://www.libfc.com and www.inceif.org/CIWM. The Centre is a joint initiative between BNP Paribas Malaysia Berhad and INCEIF dedicated to support the growth of the Islamic wealth management industry, asset management and capital markets with the key objectives of furthering education and research, industry innovation, and policy development. To facilitate the planned objectives, the Centre will undertake applied research, and conduct workshops, conferences, roundtable discussions and public lectures in the areas of Islamic wealth management that covers aspects of wealth generation, accumulation, protection, purification and distribution. The Centre aims to be a catalyst of innovation in the nascent area of Islamic wealth management by enhancing the knowledge and know-how of practitioners, Shariah scholars, students, investors and the public. It will also undertake applied research in specialized Islamic wealth management areas to provide solutions to issues in the global Islamic wealth management industry, thus further enhancing Malaysia’s position as a regional and international hub for Islamic finance. The scope of the Centre is aligned to support the growth of the Islamic wealth management industry that can offer innovative financial solutions to meet the more sophisticated investment demands of the increasingly affluent population particularly in Asia and the Middle East, thus positioning Malaysia as a regional and international Centre for Islamic fund and wealth management, as stated in the Financial Sector Blueprint of Bank Negara Malaysia. The Centre is an important collaborative effort between a global bank with a strong local presence and a university aiming to be a thought leader in Islamic Finance education. The setting up of the Centre augurs wells for Malaysia as the country seeks to become an internationally recognised hub for Islamic wealth management.